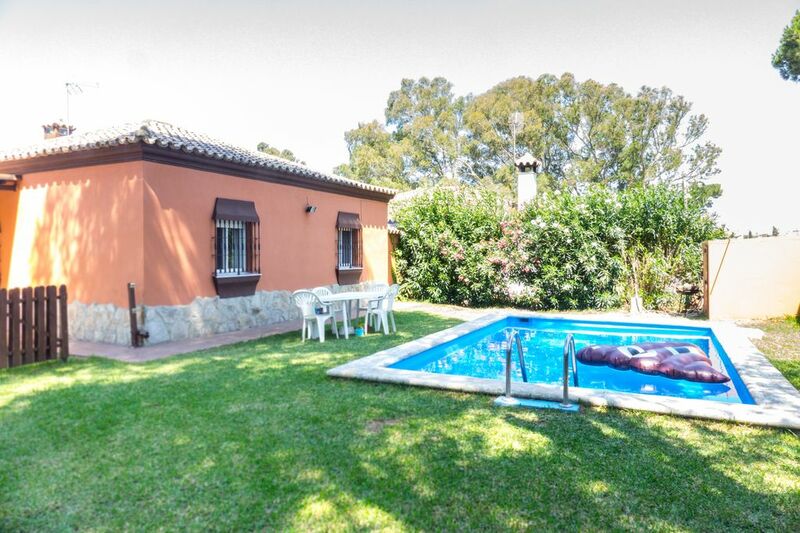 Quiet and charming holiday rental villa in Chiclana de la Frontera (Cádiz), more precisely in the area of Pago del Humo. This property has a maximum capacity for five people, distributed over three bedrooms, two of which have double beds and the other has one single bed. The kitchen is very well equipped and is American style, containing all that you may need for your holiday. There is one bathroom and a carefully decorated lounge. There is a private pool (open during the summer season) and a garden area with exterior furniture, ideal for a well-deserved holiday in Chiclana. Chalet Eucalipto has a great location just under 20 minutes from Barrosa beach by car. Its location is also ideal for getting to nearby beaches such as that of Roche and Conil. Close to supermarkets and an area with shops. A great holiday home to spend a few days with family or friends. The area where it is located is very quiet. La limpieza, la comodidad de las camas, la cocina.